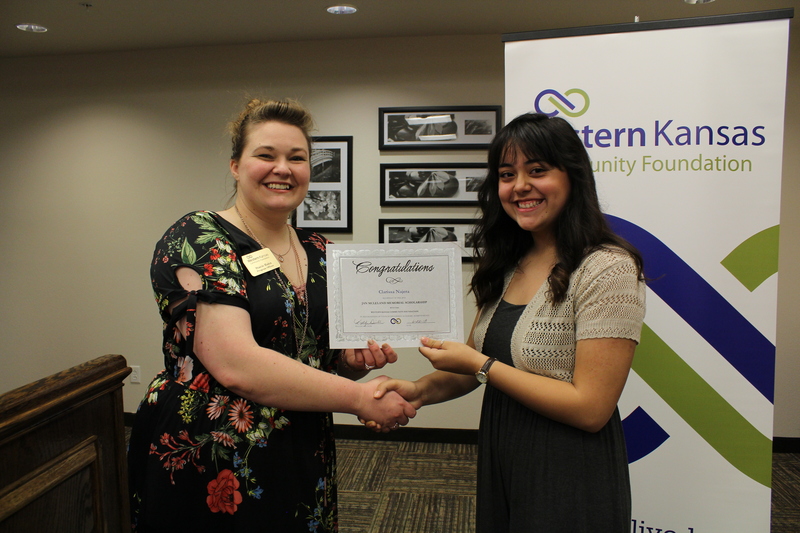 On June 22, the Western Kansas Community Foundation hosted its annual scholarship reception to honor both scholarship recipients, and the donors from whose funds the scholarships are awarded. In total, the Foundation awarded 42 students with scholarships from 16 different scholarship funds. In addition, the Foundation makes distributions to Garden City Community College Endowment Association from four other funds for the purpose of providing scholarships. In total, scholarship awards and distributions to provide scholarships for the 2018/2019 school year will amount to over $109,000. WKCF scholarships are awarded once per year, with most applications coming due May 1st each year. Application forms and guidelines for each scholarship can be found on the Foundation’s website at www.wkcf.org/scholarships. To learn more about the process, or setting up your own scholarship fund, visit the WKCF website, call 620-271-9484, or stop by the office at 402 N. Main in downtown Garden City. WKCF Program Officer Stacie Hahn presents the Jan McLeland Memorial Scholarship award to Clarissa Najera. Here is a listing of WKCF Scholarships for 2018 that have been awarded so far. 1. Bernadine Sitts Intermediate Center Scholarship, for senior graduates who were students of Bernadine Sitts Intermediate Center, Garden City ($1,000/per): Kade Brennaman, Meghan Espinosa, Elizabeth Guymon, Alexis Powell. 2. Charles Helfrich Memorial Scholarship, for seniors graduating from a Gray County High School in Cimarron, Ingalls, or Montezuma ($1,000): Allie Vanderree. 3. Chase Mitchel Webber Memorial Scholarship, for seniors graduating from Sublette High School ($1,000): Chloe Simmons. 4. D & L Hewes Scholarship, for seniors graduating from a High School in Gray County, KS ($1,000/per): Josh Neuschafer, Anna Teichroeb, Jeremy Berg. 5. Duane Nichols Memorial Scholarship, for seniors graduating from Holcomb High School and Norwayne High school in Creston, OH($400/per): Christopher Nemechek, Taylor Sleep, Traevon Alford, Gavin Stika. 6. Garden City Wrestling Alumni Scholarship, for seniors graduating from Garden City High School who participated in GCHS wrestling ($440): Kaj Perez. 7. Jan McLeland Memorial Scholarship, for seniors graduating from Satanta High School ($450): Clarissa Najera. 8. Katherine C. Jones Continuing Education Scholarship, for graduates of Holcomb High School who have completed at least one year of school at an accredited college, technical school, or university ($910): Kaitlynn Hammond. 9. Katherine C. Jones Scholarship, for seniors graduating from Holcomb High School ($1,130): Megan Burrows. Zachary Barrie, Kayde Brooks, Joseph Clark, Cesar Estrada, Mariah Litton, Mikel Osborne, Meleny Porras, Blair Rockhold, Rheann Rodenbur, Prisma Rojas, Katerina Sandoval, Kaylee Simon, Anna Teichroeb, Allie Vanderree, David Varela, Jenalyn Weimer. 12. Tanner Dean Born Memorial Scholarship, for seniors graduating from Holcomb High School ($300/per): Steven Crain, Sheila Robles. 13. Youth Entrepreneurs Summer Partnership Scholarship, for students participating in the Garden City Youth Entrepreneurs Summer Partnership Program ($1,500): Jack Koehn.